It's really not that difficult. After all, the majority of western literature is predicated on it, as is most religious belief. Yes, there are some people who literally believe that the earth is 6,000 years old and that fossils are God's way of testing our faith, but they're the exception, not the rule. What's so difficult about the symbolism in this story? BREMERTON, Wash. - Art Conrad has an issue with the commercialism of Christmas, and his protest has gone way beyond just shunning the malls or turning off his television. 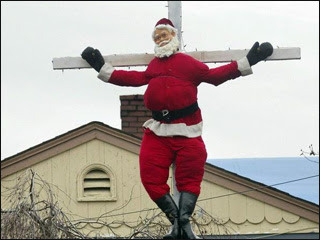 A photo of the crucified Santa adorns Conrad's Christmas cards, with the message "Santa died for your MasterCard." Jake Tally walked by on Friday and chuckled, but did not pretend to understand the message. "I don't really know what to think. I know it's about God but Santa has nothing to do with it," he told the Kitsap Sun newspaper. Oh Jake, why dost thou test me so?